Tikker watch counts down to your estimated death. YOLO! If the ancient Roman poet Horace of “carpe diem” fame were in the market for a wristwatch, he’d nab a Tikker. The so-called “death watch” calculates the likely moment of your death, then its LCD display ticks off each fleeting second of your remaining time on earth, delivering a metaphysical jolt with every glance at your wrist. While the psychological impact of having a constant reminder of death within arm’s reach might be hard to swallow, Tikker’s actuarial calculation is supremely user-friendly: Simply fill out a lifestyle and health questionnaire and deduct your current age from the results. Then let the countdown begin. 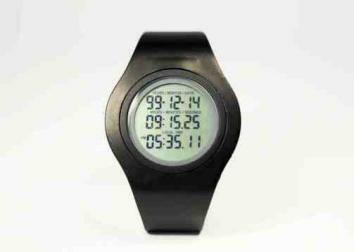 Founder Fredrik Colting came up with an idea of a death watch when his grandfather passed away several years ago. “It made me think about death and the transience of life, and I realized that nothing matters when you are dead. Instead what matters is what we do when we are alive,” Colting is quoted as saying on the company’s Kickstarter page. With 22 days left before its pledge drive expires, Tikker has already exceeded its $25,000 goal by raising $38,368 from 861 backers. On first glance, a digital crowdfunding push may seem counterintuitive given that most people age 30 or younger don’t wear wristwatches since ubiquitous smart phones with clocks has obviated their need. At least, that has been the conventional wisdom, which may or may not be shifting with the release of Samsung’s new smart watch. On the other hand, perhaps Tikker has tapped into a rich cultural vein that transcends generational divides. The $39 gadget would seem not only to validate but actually quantify millennials’ YOLO ethos. And the uber-popular Breaking Bad’s protagonist Walter White would have continued teaching high school chemistry in obscurity had his terminal cancer diagnosis not catalyzed his dark ascension to the apex of the southwestern U.S. meth trade as the seconds of his life ticked away. The watchmakers hope that a constant reminder of life’s ephemeral nature will reframe users’ attitudes, gradually leading them to be happy rather than sad, to forgive rather than remain angry, to wear a smile instead of a frown. But if Urban Dictionary is correct in that YOLO translates roughly to “carpe diem for stupid people,” maybe Tikker’s goals are unrealistically high-minded for young users whose YOLOism tends more toward social Darwinism than life-affirmation.